For many years now, Kathmandu has been known as the city of opportunities, abundance, and hope. Ironically, the same city dwellers have also been entangled in huge scarcities, deprivation, and denial. One of such perpetual complications is the city’s inability to benefit from the abundance of rivers in Nepal. 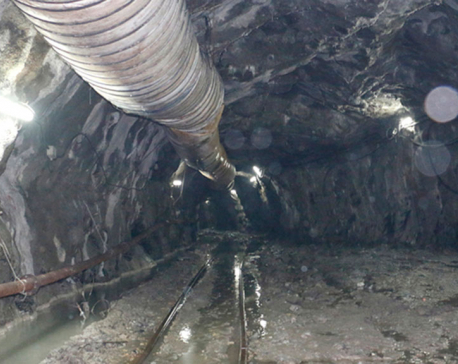 The Melamchi Water Supply Project (MWSP), implemented in 2007, did come as a ray of hope among the valley inhabitants. It is considered to be a long-term solution to eliminate water shortage in the valley. The project is first estimated to distribute 170,000,000 liters of water in the valley. After the completion of this first phase, the project plans to divert Yangri and the Larke River that will supply at least 12 hours clean drinking water to each tap by bringing an additional 340,000,000 liters of water. But even after a decade-long wait, Kathmandu Valley is still struggling with water shortage. Adding on, dug out streets, piles of dust, and hasty activities on the roads to bring Melamchi water into the valley is dramatically increasing the level of pollution on the city roads. “Our hopes wane a little each time the deadline is extended. 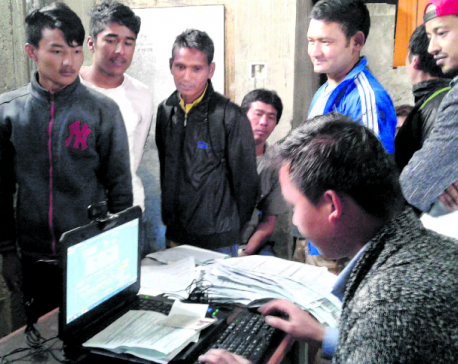 Sundarijal-based bulk distribution system was supposed to be completed last October. They said they would complete the construction of Ambathan-Gyaltham tunnel by December. But nothing has been accomplished till today. How much longer are we to wait? 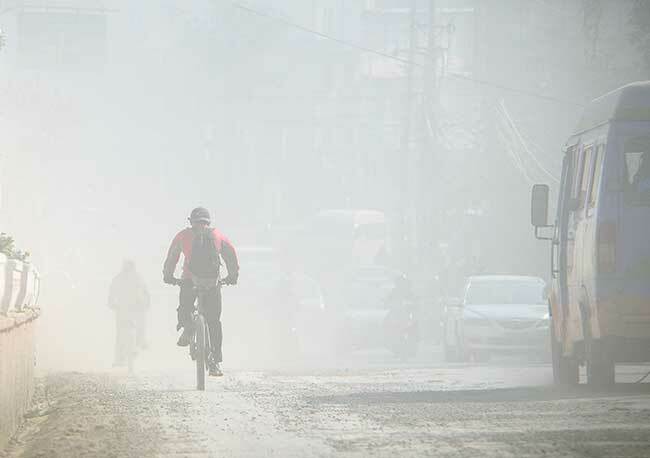 The dust and pollution is just degrading our health and lifestyle,” says Sumitra Paudel who is pursuing her Masters in Economics at Tribhuvan University. Sushmita Shakya, a social work student at St. Xavier’s College, says that she is really concerned about the mounting air pollution level and its health repercussions. “My sister is suffering from a chronic dust allergy. 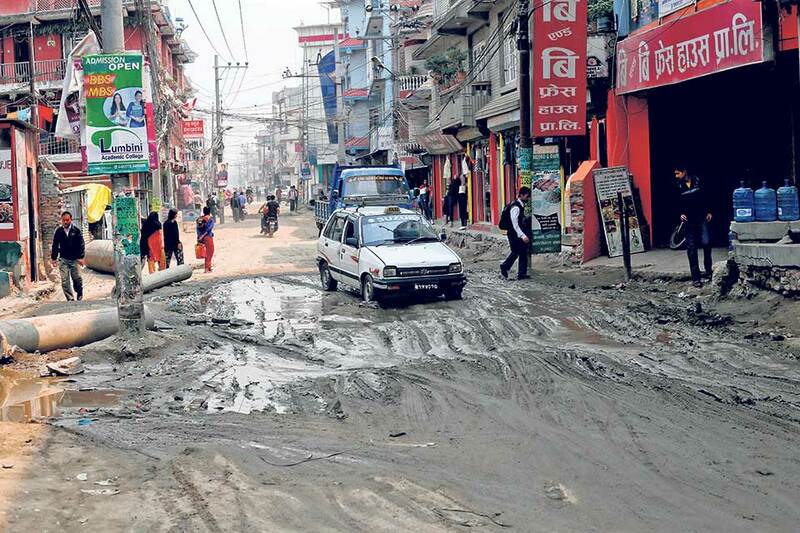 Delay in fixing the roads dug for the Melamchi project has worsened her condition. She has to take multiple medicines every day to keep her condition in check,” she says. According to Dr Birat Krishna Timilsina, DM cardiology resident at Bir Hospital, air pollution has many adverse effects on human health. Inhalation of minute dust particles due to various construction projects and increased vehicular emissions have definitely increased the number of patients in hospitals suffering from lungs and heart diseases. “Air pollution can have both long and short term effects in a human body. Most recent researches have indicated that breathing polluted air and minute dust particles can lead to an increased risk of heart attacks and stroke. Tiny dust particles can escape from the lungs and enter into the blood stream making them difficult to be removed from body’s filter system,” he explains. According to Dr Timilsina, dust pollution may also affect young and healthy lungs in the long run causing respiratory problems such as bronchitis. Unhealthy lungs may lead to insufficient supply of oxygen to all parts of the human body giving way to many chronic diseases. Tiresh Prasad Khatri, chief of Project Implementation Directorate at MWSP, says the project does follow some essential environmental laws while digging and repairing the roads of Kathmandu. Green netting, water sprinkling, and working at night are some of the precautions they take while laying down water pipes. However, these measures have not done much to lessen pollution in the valley. “The best way to get rid of pollution is blacktop our roads as soon as possible. We are eagerly trying to start this process so that Kathmandu residents can get respite from dusty streets soon,” says Khatri. However, according to Mukti Gautam, spokesperson at Department of Roads (DoR), Government of Nepal, they cannot begin blacktopping the roads unless all the entire water supply system is completely tested. The DoR is responsible for repairing about 80 kilometers of road inside the valley and the remaining 140 kilometers has to be looked after by MWSP. “MWSP has advised us not to start with the complete reconstruction of roads. First, they need to check the entire system, find out the possibilities of leakages only then can we start our project,” says Gautam adding that he hopes that possible leakages are checked upon as soon as possible so that the construction work can begin. However, spokesperson Gautam assures us that the four-kilometer stretch at Kalanki will soon be smooth. “The construction of the four-kilometer-long road from Nagdhunga to Kalanki was delayed due to the difficulty in demolishing the existing houses and managing haphazard electricity poles. Minor problems have been solved now and the road will be ready in less than two months,” he says. However, these frequent reassurances from the government do not seem to bring any relief to the valley inhabitants. Many confess that they feel like empty words and promises. But the reality inside MWSP looks a bit different. “Water from Melamchi was first supposed to be supplied to Sundarijal and from there it was to be distributed to Kathmandu. Although construction of pipelines has already been completed in Sundarijal, the project is facing a lot of infrastructural problems,” says Shanti Bhattarai* (name changed), engineer at Dohwa Engineering Company Limited in association with ERMC, BDA and TEAC. “It’s funny the project has already been granted a completion certificate when the pipelines are not functioning due to immense water leakages,” she adds. Another problem that this project is facing, according to Bhattarai, is the lack of accurate data. “The entire design of this project was made based on a survey conducted five to seven years ago. The demography of Kathmandu changes every month and data collectors could not accurately estimate the sewage system and the old water supply lines of each lane. These little things have delayed the entire process of implementation,” says Bhattarai. She also mentions that precautions such as green netting and water sprinkling were not taken from the beginning of this project. “Only after a public backlash did they start spreading green nets, sprinkling water, and working at night at some places. I would say this pathetic situation is due to the negligence and apathetic attitude of the entire project officials towards public health,” she adds. The Ministry of Health has also not given any directions to this huge project that has negatively affected the health of almost every city inhabitant. “Reconstruction of roads or laying down underground pipelines is not our concern. I understand it is creating a lot of health hazard but there is a separate department that must look after it,” says Haridas Sharma, information officer at the Ministry of Health. According to him, the Environment Protection Committee of the previous parliament had repeatedly instructed MWSP to take preventive measures in controlling the pollution levels in Kathmandu. But, like most policies in Nepal, these measures too are only limited to papers. While on one hand people have a lot of hopes pinned on the project, on the other hand, it has brought about a lot of health woes as well. “I hope this project gets completed soon. Only then will we have pedestrian friendly streets as well as regular water supply. Till then we will need to take care of ourselves,” says Paudel. Dr Timilsina also advises, “We can’t wait for the government to do something. Everyone should pay attention to his/her own health. Basics things like wearing a mask every time you go out and avoiding construction sites as far as possible can go a long way in minimizing health hazards brought about by the current environmental condition,” he says adding that those already suffering from lungs or heart disease should be extra careful while going out.